“She never stopped looking for him. He never stopped thinking about her,” the wedding announcement reads. The high school sweethearts didn’t connect for years. Jeri Ann Currie, now Halford, and Claryl Haggard grew up east of Highway 93 between Ronan and Pablo. Although both families lived on the canal, Claryl went to school in Ronan, and Jeri in Polson. They really didn’t get acquainted until their brothers became friends. Haggard had three brothers, and his mother was pregnant when his father died at 27 from a brain aneurysm. His fourth brother was born, and his mother remarried. That marriage was short-lived since the gentleman died of tuberculosis, but the boys gained a sister from the union. Then Haggard’s mother married Johnny Jones, “a saint of a man,” who took on four little boys and a little girl. Bernie Haggard, Claryl’s fourth brother, became friends with Jeri’s brother, Dan. The two boys went fishing, hunting frogs and just hung out on the canal. One day they invited Jeri along, and she accompanied them to Bernie’s house to find a fishing pole. Then Claryl asked Jeri if he could walk her home. “My heart went thunka-thunka-thunk,” she remembered, resting her hand on her throat. Claryl was blond, had piercing blue eyes and was “the epitome of handsome,” she said. For two years they were just friends, Jeri explained. The teenagers would meet on the canal to swim, hike and ride their horses. Claryl told Jeri he knew he was in love with her one time when she called him in the middle of the night. He was touched that out of all the people in the world, she had called him when she took her dad’s snowmobile out and got stuck in the tribal wilderness. The pair started dating when Jeri was 16. “We would always go to the show,” she said. Claryl was respectful, asking to hold her hand and gently brushing her hair off her shoulders. “We would talk for hours and hours on end about everything,” she recalled. When Claryl turned 17, teenage rebellion set in and his responsibilities at home were overwhelming. His stepdad encouraged him to join the service, and he did. Claryl came home once on leave, and the couple went to the show, but then she never saw him again. 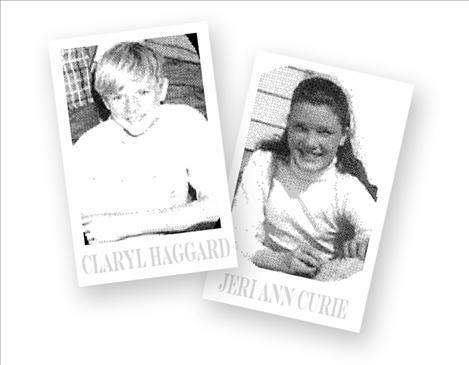 After his release from the military in 1972, Claryl was told Jeri had married. “But I wasn’t, I was still waiting to hear from him,” she said. Jeri said Claryl told her it broke his heart when he heard she had married, so he re-enlisted. In 1973, Jeri did marry. She worked for the county extension agent in Kalispell, involved with 4-H youth at the Northwest Montana Fair. Selling popcorn and pop to raise money for a 4-H trip, Jeri heard somebody call her name. After the introduction, she quit selling popcorn, went home and cried. For 42 years, she searched for Claryl in the only way she knew how — by checking phone books in towns she visited, such as the port towns in Washington, Reno, Nev., and Odessa, Texas — anyplace she visited. Jeri divorced and moved home to the Mission Valley 14 years ago. She lives on the same place she did as a child, but in a different house. Last summer, Jeri gave Facebook a try and found Claryl’s brother, Bernie, and he gave her a phone number for Claryl. It was out of service. “Talk about a roller coaster ride,” she said, shaking her head. Bernie contacted his mom in Whitefish, got the correct number for Claryl and called him. Claryl said to give Jeri his number in Dillon, where he was working on a ranch. “It took forever for me to dial it. I would start to dial and hang up. My hands were shaking, but I finally got through. Just to hear his voice was so cool,” she said, with a huge grin. Jeri told Claryl she was going through Dillon in October to take her mom south for the winter and would like to see him. He was single and hadn’t dated in eight years. The couple started phoning each other. “Every night he would call me,” Jeri said. He said of course she could. Then he asked if she’d seen him almost fall down in the parking lot. “When I saw you, all the feeling came back and I almost broke down in tears,” Claryl told her. After installing her mother down south, Halford spent more time with Claryl, telling him she had to resolve her feelings for him. “I have loved you so deeply for so long that it’s unhealthy. It’s an obsession,” she told him. 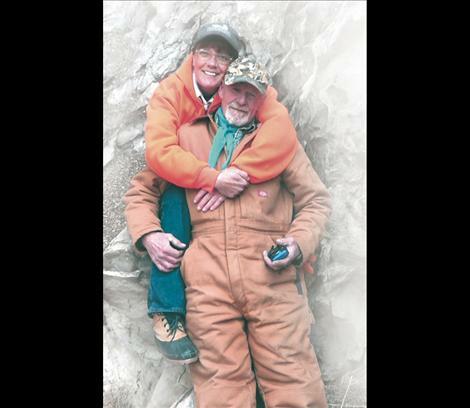 After a hunting trip to Dillon in November, Jeri said they spent hours on the phone, talking about everything they could that could throw up red flags — religion, politics, gay marriage. “We just couldn’t come up with anything to fight about,” she said. “By Feb. 13, we were engaged,” Jeri said, smiling down at her ring. Now their wedding is just around the corner. It will be at their home at 4 p.m. on Aug. 4 in front of the sheep wagon Claryl restored for the big day. “We’re gonna have a pig roast and a potluck. After the ceremony, we’re going to ride our horses down the canal,” Halford said, bubbling over with details and enthusiasm. The Old Time Fiddlers, with whom Jeri plays, will provide music for a barn dance later. Her two brothers will be her “bridesmaids;” her son Cole will give her away; Claryl’s son Ceth will be his best man and his brothers, his groomsmen. His sister Jeri, who’s in her 40s, will be their flower girl. “And my mom’s the photographer,” Jeri added. Claryl is moving from Dillon to Polson, where he hopes to find a job. He’s worked as a heavy equipment operator, on ranches and as a veterinarian’s assistant. Jeri said her mother, who spends half the year in Montana, adores Claryl, and Jeri’s son has been calling him “dad” since December. She will continue teaching at Fiddlesticks School of Music and working at Walmart. “He’s bringing six horses and three dogs so that will be a total of 10 horses and six dogs,” she said, still grinning. “I’m so excited about what our future holds for us,” Jeri said, her eyes shining.